Today's outfit is very basic but has been my go to for a while when I don't know what I want to wear. I found this Haute Hippie top and fell in love with it. I have been looking for a good white silk blouse/tunic top for a while. I know I will get tons of use out of this in the Fall. It would look great paired with dark skinny jeans and over the knee boots and even with a faux fur vest over it. Another item that I felt like was worth the money because it is basic and goes with everything. P.S. I told you guys when I wear loose tops I don't look pregnant! I am officially 20 weeks pregnant! Yay to being half way there. I feel like it is kind of a big deal! We are just so excited and can not wait for her to be here. It is so crazy how much we love her already. I really didn't know it was possible to love someone you have never met so much. She is so active and is moving and kicking all the time. Which has definitely been my favorite part of being pregnant. Glamorous and beautiful outfit! I like your blouse and shoes very much! Congratulations on 20 weeks! So exciting! I love this classic look! 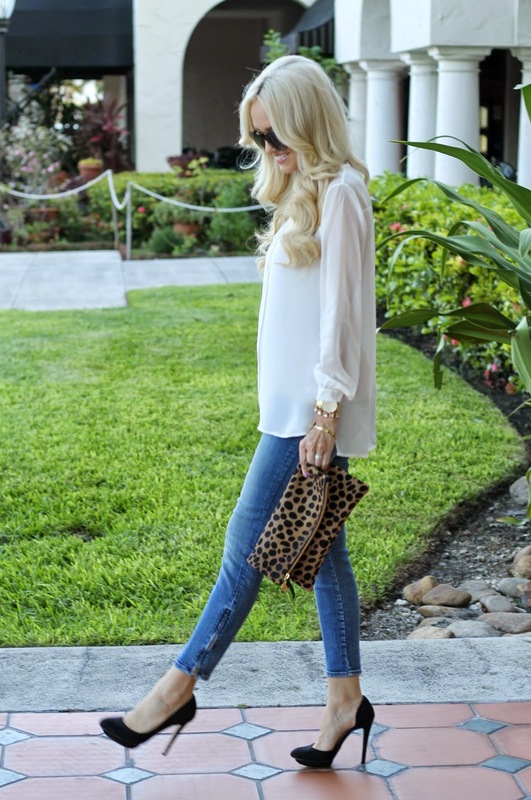 That top looks great on you and I love the leopard clutch! Yay for 20 weeks! You are just the cutes and this classic look is flawless on you! this look is so classic and will never go out of style! and your hair looks gorgeous here, as well! Yay! Congrats on 20 weeks, you look absolutely stunning!! Looking great, mama! I'm just a bit ahead of you at 21 weeks.